For Americans of my generation, the word “victuals,” pronounced ‘vi-dls and sometimes spelled “vittles,” conjures up images of Granny Clampett of “The Beverly Hillbillies” cooking up something for Jed and the family. My own Grandmother Harbison occasionally used the word to refer to the scrumptious real food she was always preparing. The word comes to us, after some alterations through French and English, from the Late Latin victualia meaning provisions for human consumption. My grandmother’s use of it probably harks to her Anglo-Saxon roots filtered through Appalachia. Those Anglo-Saxon roots are also likely the reason she sometimes still used the word “poke” to refer to a sack or bag. These memories were conjured by the book I just read. 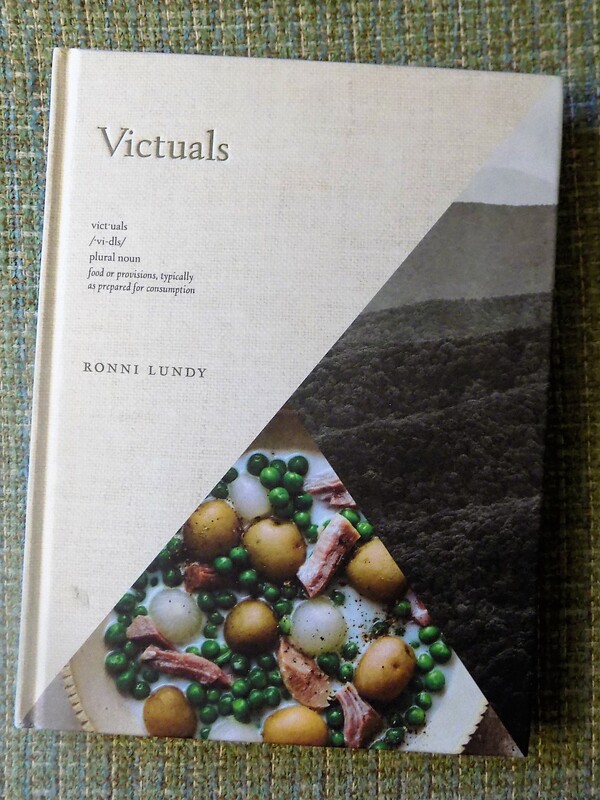 I enjoy cookbooks that read like a narrative and few cookbooks fulfill that purpose as beautifully as Ronni Lundy’s Victuals: An Appalachian Journey, with Recipes (New York: Clarkson Potter / Publishers, 2016) with photographs by Johnny Autry. Victuals explores and extols the foodways of the Southern Appalachians. The book has agendas: sustainable farming and environmental concerns come through loud and clear. But ultimately it is a celebration and explanation of a part of the country and a way of living that is sometimes undervalued and marginalized. Victuals introduces the reader to a variety of farmers and butchers, chefs and cooks, purveyors, environmentalists, and food experts throughout the region. Many faces are new and others are familiar names like Chefs Sean Brock and John Fleer, and Chef Erik Neil of Chattanooga’s Easy Bistro and Main Street Meats. I was pleased to see a mention of Big Horse Creek Farm in Lansing, North Carolina, where a few years ago Suzanne and Ron Joyner were able to hook me up with some of the Hackworth apples that my mother remembered from her youth in Cullman County, Alabama. Johnny Autry’s enticing photographs set one’s mouth to watering even before the text can be read. Soon after I received the book I casually opened it to a photo of English Pea Salad with Cream Dressing; it made me long for a taste and brought up memories of a long-forgotten dish. The recipe for Spiced Pickled Peaches makes my longing for the start of the spring Chilton County peach crop in a couple of months even stronger. There is even a mouth-watering section about chili buns and slaw dogs. Other recipes inspire new ideas, such as “Buttermilk Cabbage Soup with Black Walnut ‘Pesto’” or “Ginger Bean Chowchow.” There is a piece on greens that is as informative as anything I’ve ever read about those Southern standards. Lundy’s exploration of Appalachia extends from southern Ohio and West Virginia to northern Georgia. She does not include the southernmost Appalachian regions of northwest and north central Alabama but much of her reportage rings familiar to what I know and other segments, going deeper into the heart of the region, hold surprises. Lundy is confronted with and explores the idea of “aspirational eating” – a foodways theory that suggests that the move from home-grown foods to convenience foods and commercial products was fueled not by convenience, availability, and taste but by the “aspiration” of the region to be more like the mainstream families seen in print ads and on television. This is apparently a new concept to Lundy (as it was to me) when she is first asked about it by an oral historian, but as she encounters the idea more she feels compelled to consider and address it. Victuals is full of that kind of true and direct mountain wisdom. This entry was posted in Victuals by Ronni Lundy and tagged aspirational eating, author Ronni Lundy, Big Horse Creek Farm, Chef Erik Neil, Easy Bistro and Bar, Imladris Farm, John Stehling, Main Street Meats, photographer Johnny Autry, southern Appalachian foodways, Southern Foodways Alliance, Suzanne and Ron Joyner, Victuals cookbook, Walter and Wendy Harrill on March 15, 2017 by gedwardjourney.